I found recently this amazing Mac application called Spark that allows you to define global shortcuts keys (hotkeys). Here are some utility scripts I conjured to make my life easier. Copy the current Finder path to the clipboard. Open an iTerm in the current Finder location. And here’s a simple python script that allows you to connect to your machine and debug your client output. It basically echoes to stdout everything that gets passed to it. Specially useful to debug HTTP GET requests. # host = 'localhost' # to restrict to localhost connections only. This weekend I had the pleasure of reading 1984 written by George Orwell. I really can’t think of any adjective that qualifies this book in all its greatness. Really loved the way O’Brien asserts that controlling one’s mind is controlling the reality – there is no other reality other than the one the man’s conscious mind is able to perceive and controlling that is controlling the laws of the Universe. Basically if one can push any thing to the human’s mind that they’ll accept as real, then as far as everyone’s concerned it is actually real. Brilliant book – strongly recommend everyone to read it. Another book that I’ve finished recently and also recommend is Douglas Adams’ “Last Chance to See…”. 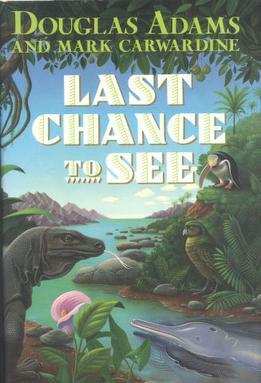 It’s a lightweight reading where Douglas narrates his journey around the globe to find species on the brink of extinction. The weird situations he ended up in along with his unique sense of humor make this a very enjoyable book to go through! Good thing the pixel wasn’t the only broken thing in the laptop. Quite happy with the new one they gave me!! !